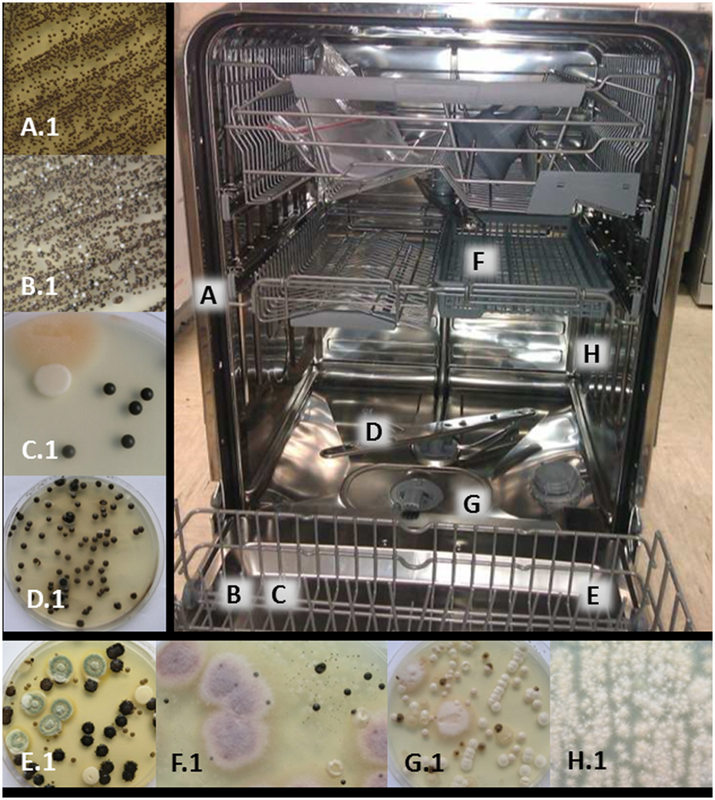 Opportunistic Fungal Pathogens in Dishwashers and Kitchens – microBEnet: the microbiology of the Built Environment network. An interesting new paper titled The Black Yeast Exophiala dermatitidis and Other Selected Opportunistic Human Fungal Pathogens Spread from Dishwashers to Kitchens came out several days ago in PLoS one. ZupanÄiÄ et al investigated the fungal diversity and distribution of 30 dishwashers. Swabs were taken from various parts in the dishwasher, sink, and on items that had been washed in the machine. As a comparison, the same things were swabbed in kitchens without dishwashers as well. Swabs were grown on plates to determine CFU/cm2. Fig. 1 from ZupanÄiÄ et al. Some of the samples were also sequenced to determine the species of fungi from the plates and metagenomic analysis was done on biofilm samples from the rubber seal on the dishwashers. They found a number of opportunistic human fungal pathogens colonized the inside of dishwashers and other surfaces, and propose that water may be a vector for spreading fungal contamination in kitchens. Table 3 in ZupanÄiÄ et al. Black yeast was actually not found on any of the dishes that were run through the dishwashers before being swabbed. Rather, it was found in biofilms on the rubber seal of the machine. Indeed, kitchens with a dishwasher were found to have a higher incidence of black yeast contamination than kitchens without a dishwasher. They propose that this may occur because hot aerosols containing black yeast released immediately after opening dishwashers then disperse across kitchen surfaces.